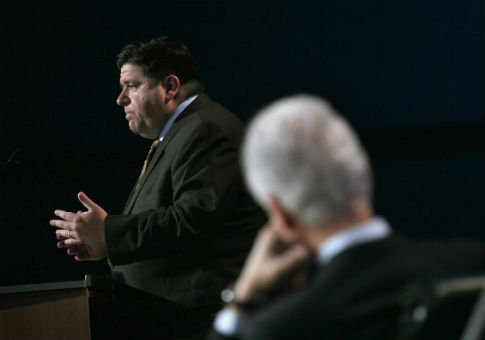 J.B. Pritzker, the Democratic billionaire currently running for governor of Illinois, sought an appointment to public office in 2008 from then-Gov. Rod Blagojevich (D.), according to conversations captured by secret FBI wiretaps. Blagojevich, who in 2011 was sentenced to 14 years in prison for corruption after soliciting bribes for political appointments, considered appointing Pritzker as either Illinois state treasurer or attorney general, the Chicago Tribune first reported Wednesday. The disgraced former governor intimated that he would seek a substantial campaign contribution in exchange for giving Pritzker a senior political office. The conversations between Blagojevich and Pritzker, a major Democratic donor, took place in 2008 just days after Barack Obama was elected president and vacated his U.S. Senate seat from Illinois. The discussions were captured by secret FBI wiretaps, which were given to the Tribune. Several of Blagojevich's convictions involved his efforts to trade an appointment to Obama's vacated Senate seat for campaign money. In the lead up to Blagojevich's arrest in December 2008, he and Pritzker communicated regularly, discussing the impending Senate appointment, the ongoing investigations into Blagojevich's administration, and the financial troubles of a bank owned by Pritzker's sister. Pritzker informed Blagojevich in a recorded phone call that he was "really not that interested" in the Senate seat. But he said he might be interested in something else: Illinois state treasurer. "Ooh, interesting," Blagojevich responded. "Let's think about that. You interested in that?" "Yeah," Pritzker said, "that's the one I would want." At the time, Pritzker believed that the position of treasurer would soon be vacated. Its current occupant at the time, Alexi Giannoulias, was expected to take a spot in the Obama White House. Blagojevich also asked Pritzker for what the Tribune described as a "significant campaign contribution" during a conversation about the possible appointment. While discussing the appointment, Pritzker said, "I've got a lot of reasons why it makes sense. The problem for you would be the same problem with the Senate really." "I've given you contributions," he added. "Total nonissue," Blagojevich replied. "First of all, you give money to everybody, like [Attorney General] Lisa Madigan, OK? … Which, incidentally, if you can do for me what you did for her, before the end of the year. Can you think about that?" Pritzker had donated $50,000 to Madigan during the previous year. "I can't, I mean, not while everything's up in the air, but I hear ya," Pritzker said. "I hear ya and, and, and … But anyway …"
"If we go in that direction, though, if that does happen, I mean there's some other people who can help us that you know," Blagojevich said. "If you feel skittish about that, which I believe you shouldn't, but go ahead," Blagojevich continued. "Yeah," Pritzker said. "I don't think we should even talk about it but I understand what you're saying." Blagojevich also suggested that if he could not appoint Pritzker to be treasurer, then the billionaire could conceivably be appointed to replace Madigan, who Blagojevich was also considering for the Senate. Blagojevich even asked Pritzker if he had a law degree. "Are you a lawyer?" Blagojevich asked. "There's an AG that I appoint." "Ooh, that's interesting," Pritzker said. "I mean I'm not promising," Blagojevich replied. "I'm just saying these are all scenarios." Pritzker and Blagojevich's friendship is at least ten years old, dating back to when Pritzker ran unsuccessfully for a congressional seat in Chicago's north side. Blagojevich, then in Congress, applauded Pritzker and expected "big things" from the billionaire. "We are going to hear a lot more from J.B. Pritzker, because ultimately, in the long haul, quality will emerge, (as will) J.B.'s knowledge of issues and his commitment to those issues," Blagojevich said in a 1998 profile of Pritzker. "This was a good first start and I think J.B. has a tremendous future. Remember, Abraham Lincoln didn't win his first election and Mario Cuomo lost several races before he got elected. For J.B., this is only the beginning." The two also have an intertwined financial history. Pritzker and his wife, Mary Kay, donated at least $140,000 to Blagojevich's gubernatorial campaigns from 2002 to 2006, the Tribune noted. In addition, Pritzker gave $500,000 of his own money to rebuild the Pilgrim Baptist Church, backing up Blagojevich's attempt to use tax money for the same project. Months later, Blagojevich issued a $1 million state grant to the Illinois Holocaust Museum and Education Center, where Pritzker served as chief fundraiser for the museum. The two men not only discussed a possible appointment for Pritzker, but also weighed the various pros and cons of other possible appointments Blagojevich could make. Discussing Obama's wish that Blagojevich appoint Valerie Jarrett to the vacant seat, Pritzker said it was only worth it if Blagojevich got something in return. "The only reason to do it is if he'll appoint you to something," Pritzker told the governor. In the end, Pritzker was given no appointment; neither Madigan nor Giannoulias left their respective offices. On Dec. 3, 2008, Pritzker called Blagojevich to tell him that he "would like to officially pull myself out of the running." Blagojevich was arrested six days later. Pritzker did not respond to a Tribune request for an interview, but he briefly addressed the story on Wednesday night during a press gaggle. "Look, there was nothing inappropriate about my conversation with the governor," Pritkzer said. "It should be unsurprising to people that after 25 years of doing public service in a variety of ways that when an opportunity might have arisen for me to do public service that I would be willing to do that. And that was what the conversation was all about." This entry was posted in Politics and tagged Barack Obama, Corruption, FBI, Illinois, Rod Blagojevich, Valerie Jarrett. Bookmark the permalink.